Activate your body with active apparel! NadiX integrates haptic technology to help Yogis improve their practice. Clever Tech Digest sat down with Olivia Burca, a garment engineer for Wearable X, to discuss the company’s take on wearable tech. All of the products we consume make an impact on the environment. We cannot fight the nature of consumption and our exponentially growing population. How, where, and with what materials things are made determine just how much of an impact a product's lifecycle can create. Clever Tech Digest sat down to chat with Crystalyn Brennan, a pioneer in both vegan leather and zero waste up-cycled leather accessories. Her company, Crystalyn Kae Accessories fights to reduce the huge amount of material waste in the fashion industry by keeping scrap materials and used products out of landfills. Brennan explains in detail mindful ways to keep our planet clean without sacrificing style. Clever Tech Digest sat down with Modgul and Budhiraja to discuss the Internet of Things, and how beautiful design can make wearable technology not only more desirable, but easier to use. 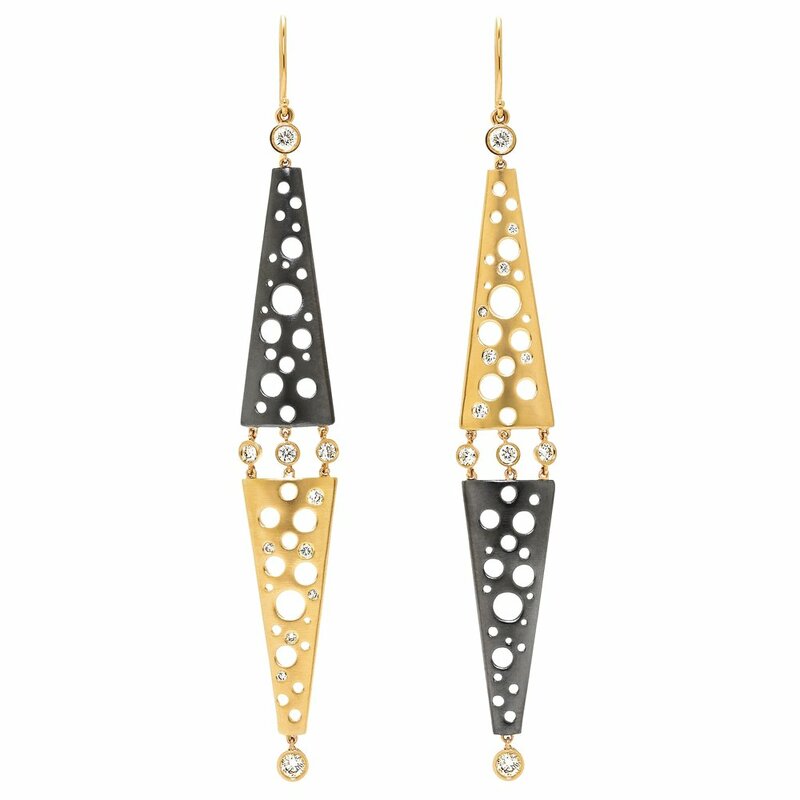 Read on to learn about Peripherii earrings, hearable devices that pair with your smart phone! Coming from a socially conscious family, Bronfman travelled, working for various non-profits, but always found herself drawn to the jewelry of places she was visiting. “There are so many people, making these things that tell a story about culture. It’s a form of self expression.” This is more than adornment - the human connections that these artefacts represent fascinate her. Mischa Abakumova is an alumnus of Parson’s School of Design and Technology, a designer with a twist. On a recent, gray, autumn morning I sat down with her at a local cafe to hear about her relocation to NYC and her wide variety of projects - whether teaching kids creative tech and interactive design at Blink Blink, exploring how tech and dance can interact at Lehman College, or imagining futuristic objects with the Iyapo Repository. She’s also building a musical instrument that will record the pulse of the musician and use that along with other biological information to define a message characterized by pitch, timbre, and duration. With each of her answers, the day grew clearer and more inviting, until we hardly noticed the drizzling sky at all. Read on to learn more about this high-tech Jane of All Trades! 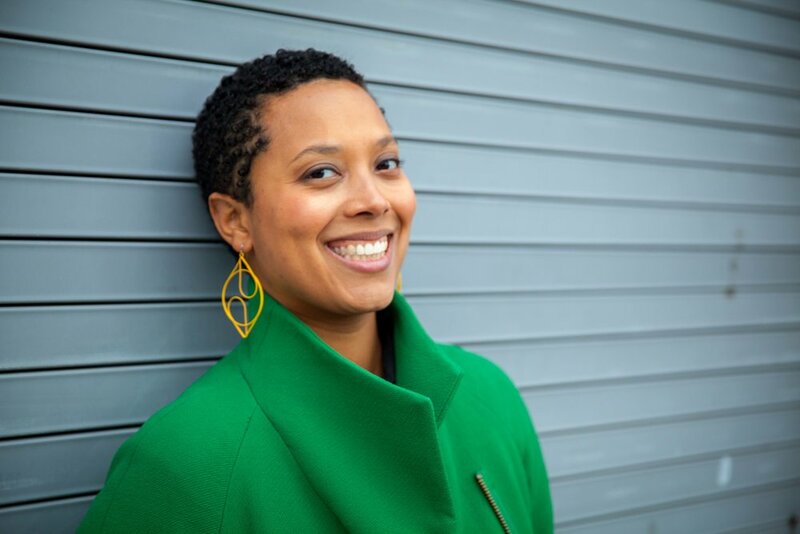 When Xiomara Lorenzo began designing her own jewelry a decade ago at Wesleyan University, she was interested in expressing an idea about the human experience - that we are all on a continuum, forever jumping off into new realms of self-discovery and definition. She had no idea that she would end up at the forefront of tech and design. Today, Lorenzo is exploring ways that these two realms, seemingly at odds with one another, can in fact work in tandem to reach new heights that would otherwise be unattainable. Clever Tech Digest recently spoke with Lorenzo about how she stayed true to her own aesthetic of continuous flow while making her way from handmade wire earrings, through metallurgy, and into to 3-D printing her stunning pieces. 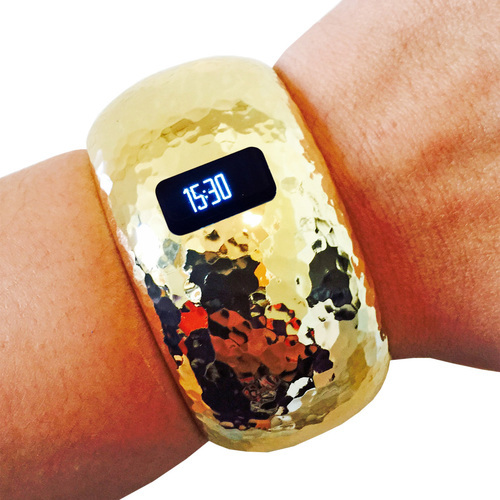 Wearable Italia produces handcrafted wearable technology, ranging from fitness trackers to incognito emergency call buttons. This company’s high end fashionable technology is redefining what wearable tech can look like and pushing back against the trendy choice of mass manufactured plastic gizmos. Clever Tech Digest sat down with founder, Andrea Tomassini, to discuss the concept of Meta luxury wearable technology, and its importance not only to users, but to our global economy. Clever Tech Digest sat down with the Wearable Media power house female trio of creative technologists and designers, Yuchen Zhang, Jingwen Zhu, and Hellyn Teng, to discuss the future of wearable tech fashion. Wearable Media strives to combine technology and fashion to help connect consumers to greater global concepts, or even celestial influences. Increasing environmental and social awareness through high fashion inspires the team's creations to push past the wearable tech market, and into Wearable Media. Wearable Media is based at the Brooklyn Fashion + Design Accelerator, and showcased their tangible social media garments at SXSW this year. For our readers just learning about Wearable Media, please describe your team's background, what Wearable Media is, and its original inspiration. We are an international and bilingual(in both English and Chinese) dynamic team of three women who are passionate about integrating technology with textiles. Each of us came from a different division of design and share a common understanding of technology. Our collaborative spirit enables us to bring all of our skills in e-textile, smart clothing prototyping, smart clothing design, user experience design, branding, visual design, IoT development, and web development together for consumers and the wearable tech community. You recently exhibited Wearable Media garments at SXSW, what new tech trends inspired you the most? The power of using data for simple and widely distributed technology really impressed Wearable Media. While we were at SXSW, we were lucky enough to meet Rebecca Minkoff. She showcased her new line of handbags with QR code sewed into the bag. You might say this isn’t the newest technology. However, this simple technology gave Rebecca’s customers instant access to loyalty programs. What guiding principles help your team develop desirable and meaningful Coded Couture instead of just another wearable gadget? In 2034, with the advancement of technology, our body and smart clothing will become more intimately connected. Ceres is a wearable garment that seeks to aid our understanding of near-Earth asteroids and deep space, in effect, turning the human form into a celestial sensing body. The garment emits electrical current throughout the sensor points in the textile, intimately vibrating against our skin, letting our body sense the range, frequency and distance of NEAs. Ceres also illuminates alongside the garment, identifying the frequency and distance through the velocity and brightness of the embedded LEDs. The embedded microcontroller in Ceres is programmed to work with NASA’s Asteroid Neo-Ws RESTful API, which collects and catalogs real time data sets of near-Earth asteroids surrounding our orbit.This API is maintained by SpaceRocks Team: David Greenfield, Arezu Sarvestani, Jason English and Peter Baunach. We recognize cybernetics and technology as a means of co-creation and re-invention, engendering new forms of expression and understanding of the environment that surrounds us. Ceres is an exploration in the expansion of our human capabilities, elevating our sense of touch and relationship with the cosmos, thus diversifying human experience within a macro + microcosm. Wearable Media is working with Cyborg Futures to explore human senses and expand them into new territories. How do you plan to create new realms for expression and understanding through this collaboration? Our collaboration with Cyborg Futures was a fascinating exploration in the field of Artificial Senses. The ideation process was to develop a method in which our senses can be artificially enhanced. Our team specifically focused on the high concept of light and the cosmos, and explored ways in how we can turn that idea into a working prototype. We looked at the translucency of skin, and what happens when light permeates the skin. We also researched data of solar flares from the Sun, and worked with NASA’s API to develop the project. 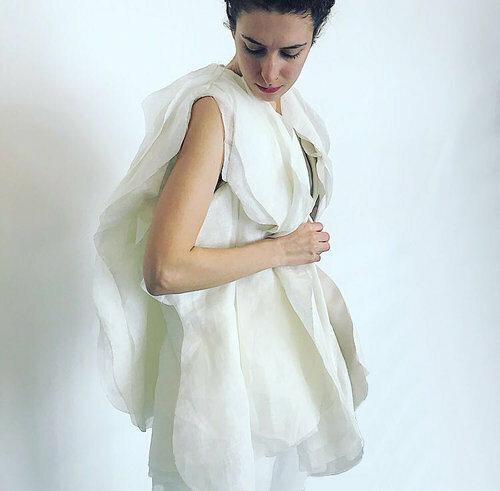 In many ways this project echoed our wearable garment, Ceres, where we were exploring the idea of turning the human form into celestial sensing bodies. With our collaboration, we delved deeper into materiality, and instead of focusing on interactions that happen on clothing and textiles, we were discovering how our bodies and skin can literally become reactive media. What do you think it will take to push Coded Couture into the mainstream market? Understanding the psychology behind why we would like to wear a certain data on our body will help Coded Couture become more relatable to the general public. The, designers could create successful garments infused with data. Setting up a production facility that could meet the demand of customizing garments with unique data is another challenge the industry must face to resonate with the mainstream market. 1. Your ideal vision for fusing the body with technology. Technology that amplifies personal creativity is the dream. A sixteen-year-old girl is going to her high school prom. She is interested in creating something unique that reflects her creativity. 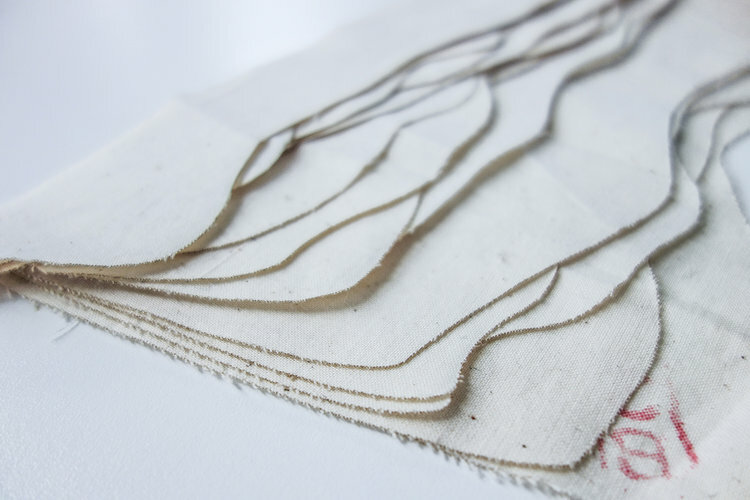 She chooses to sew her own dress and embeds e-textiles into her garment. She walks into the prom and with her body movement, her dress lights up. Her friends cheer and scream and dance around her. At the end of night, when she is in her bed savoring her own creation with the help of technology, she thinks about her next interactive project - her own lab coat to protect herself in her science class experiments. 2. Your fears for a mechanically and digitally integrated human existence. My biggest fear would be anxiety or depression caused by the digitally integrated human experience. With the usage of cell phones, we have become more connected and also separated from each other. We don’t have to feel like we are bonded to a physical place because we can access the world through our digital devices, devices that soon will be integrated into wearables like virtual reality. This could create disappointment in our physical reality when we cannot use our augmented digital abilities. A woman of many talents, Cindy Blias has brought fashionable fitness tracker accessories to the mainstream market. In 2014, she launched Funktional Wearables, a growing line of affordable on-trend jewelry pieces that conceal fitness trackers. The blending of handmade and digital technologies is taking new and exciting turns through the world of 3D modeling and rapid prototyping processes. Avant- garde fashion designers like Iris Van Herpen Hussein Chayalan, and Anouk Wipprecht have blended high math algorithms with 3D printing and computing in combination with hand-crafted techniques to create outlandish poetic artifacts for the runway. Funktional Wearables makes a more accessible product with digital fabrication methods. According to Cindy,” Every piece of jewelry and the underlying tracking technology exists as a 3D model first. These are then paired with existing models of the trackers and various arm sizes to optimize fit, look and comfort.” Without such technologies the line may not have been able to expand so vastly so quickly, but rapid prototyping and design has changed the playing field for entrepreneurs and fashionistas alike.